As the recruitment for the SSC CPO has been ended, now candidates have required to know about SSC CPO Syllabus 2018 and SSC CPO exam pattern 2018. In order to speed up your preparation, it is very important to know the structure of the exam and syllabus. SSC CPO consists of three phases that aspirants need to clear in order to get selected finally through it. Question Types: Number & Alphabet (Mixed) Series , For Example, Complete the given series a_bc_ _ cbad_bcd_cda., Semantic Series, Figural Series, Series based on knowledge etc. Level : Easy to solve, Less Time Consuming, Scoring, sometimes a bit difficult. Question Types : Coding by Analogy, Coding and decoding by letter shifting & coding letter of a Word. Could also include Coding and Decoding in fictitious language. Question Types : Find the missing number from the given matrix or diagram (Number & Alphabet based). Question Types : Questions based on Venn Diagram, Types of Question : Represent the relation between Student, Teacher and Boys (Logical), Syllogisms. Question Types : Number based puzzles like 7×5×6×5 = 6575, then 8×7×4×6 = ? . Find the correct equation type questions or quant based questions like on age, speed and distance or Seating arrangement (Linear, Circular, Double Line Up) questions. Question Types : Matrix, Jumbled words, suffix, sequence & word formation etc. Question Types : Cubes & Dices, Arithmetic operations etc. Question Types : Questions like Complete the pattern, Mirror Image, Assemble Image, Hidden Image, Counting Figures, Figure based Analogy/ Classification/ Series or cube based questions can also be asked. Question Types : Questions from Biology, Chemistry, Physics + Space Science, Computer & Mobile Technology, Pollution and Nutrition, Diseases can also be asked. Level : Knowledge can make it easy to score. Question Types : Questions from Constitution of India, Judiciary, Government Portfolios can also be asked. Question Types : Questions from India & World Geography can also be asked. Question Types : Questions from Ancient & Medieval History can also be asked. Question Types : Questions from Indian & World Economy, Economic Organisation can also be asked. Question Types : Questions from National & International News, Government Policies & Schemes, Days & Events can also be asked. Question Types : Problems on Average, Weight/ Height/ Marks, Average Money Expenditure etc. Question Types : Questions on BODMAS Rule, Fractions, Surds and Indices etc. Question Types : Questions on Average/Relative Speed, Boats, Trains etc. Question Types : Problems on Profit/Loss, Dishonest/ Successive dealings, Partnerships, Discount etc. Question Types : Problems on Work efficiency, Wages and Pipes etc. Question Types : Questions on Trigonometry ratios and Identities, Height and Distance etc. Question Types : Basic Linear Equations in one or two variables, Quadratic Identities are important. Remember all the identities and tricks to solve it. Question Types : Questions Bar/Line Graphs, Pie Charts, Tables etc. Question Types : Questions related to Similarity theorems, Circle chords & tangent theorems, Triangle congruency, Co-ordinate geometry etc. Remember all theorems. Question Types : Questions related to Plane Figures such as Square, Circles, Cone, Cylinder etc. Question Types : Passage can be on any topics. Questions are mostly fact based & can be directly picked out of the passage. Sometimes vocabulary questions are asked on commonly used words. Here is the below criteria for SSC CPO PET/PST Test. Find below the criteria for SSC CPO Medical Test. Only English section will be in SSC CPO Paper 2. This exam will be descriptive test. It will be to know your understanding & knowledge of English Language (grammar, spellings, vocabulary). SSC CPO Paper 2 will be conducted after PET/PST Test. => This will be online test. => Total questions will be asked around 200 and max marks will be 200. 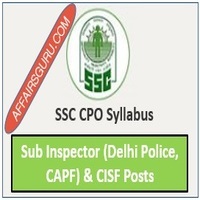 Candidates can download the SSC CPO Syllabus PDF by clicking on below link. If you have still any doubts, please comment below in box. We will reach you to asap for your queries.